Dressing to the theme of I'm a Celebrity… Get Me Out of Here! 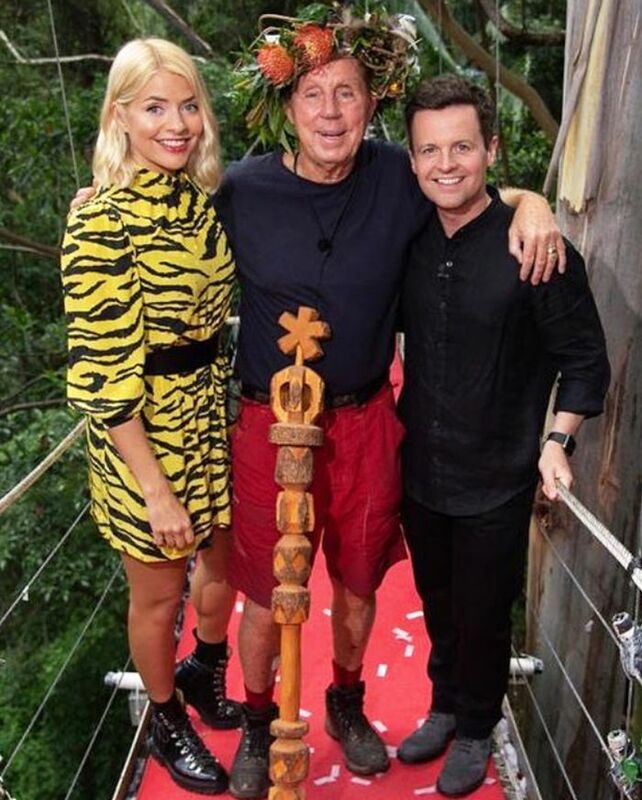 might not sound like the chicest idea, however, Holly Willoughby gave all of her outfits a distinctly Bushtucker feel. Her jungle look starts from the feet up, as every day Holly wore a pair of statement chunky boots—whether that's the soldout Grenson Nanette hikers or Ganni's cult cowboy boots. She then took the outdoorsy theme further by wearing jungle prints from snake to tiger and Western-inspired denim. It might be a departure from the knits and pleated skirts she sticks to on This Morning, however, Holly Willoughby stuck to the same mix of brands wearing mid-priced contemporary labels like Rixo, Ganni, Topshop and J.Crew. As ever, Holly's outfit posts caused items to sell out in hours, if not minutes. According to The Telegraph, Grenson sold 400 pairs of £255 black hiker Nanette boots in the hour after she tagged a picture of herself wearing them. These aren't the only boots she's causing a frenzy over, though: Her Topshop snake and hiker boots have both almost sold out in all sizes. Keep scrolling for the items Willoughby's made us want to buy on I'm a Celebrity. Style Notes: For the final Holly wore a yellow tiger dress by Zadig and Voltaire and a black leather waist belt. Style Notes: Holly paired her Grenson boots with a pair of black cut-off denim shorts and a Paris T-shirt from Maje. Style Notes: Holly wears a floral mini The Kooples dress with a pair of chunky boots by Maje. Style Notes: Holly is into the floral midi dress–and–chunky boots outfit formula in the jungle, and we're very into this Isabel Marant one. Style Notes: Holly wears a pair of black button-front jeans by J.Crew with a black T-shirt, a Rixo x Laura Jackson printed scarf and snake-print Topshop boots. Style Notes: Holly wears a red printed Rixo dress with a pair of chunky hiker boots from Topshop. Style Notes: Holly wears a De La Vali printed minidress with a pair of statement cowboy boots from Ganni.